The party season is nearing again, and what’s a party without the perfect party gear? We’ve teamed up with Perfect Party UK for a monthly birthday competition on LittleBird! Do you have a little one’s birthday coming up and want to be prepared? Perfect Party is the one stop shop for making that perfect party happen! Anyone living with a 5 year old girl knows how crucial it is to get the right Princess dress on the day of your birthday party. Go for one of the new princesses like Rapunzel from Tangled, or Sofia the First, or the more traditional types like Belle or Cinderella. Getting Uncle, Dad or Grandad to dress up will appeal to the birthday girl, and create a moment of disbelief for the other children who hopefully won’t recognise them straight away. Then you can gleefully hand over the responsibility of all the party games to the one in fancy dress. Avoid spending hours tying ribbons to balloons, and go with these pre-prepared balloon valves with ribbons already attached. Attach to balloon weights and they look great! Colourful and simple, these look great on a white paper table cover. Provide colouring pens or crayons for speedy eaters and they’ll doodle while they wait for their friends to finish. Easy to clear away too. Have a little girl? Then a Princess Party may be just the party for her! 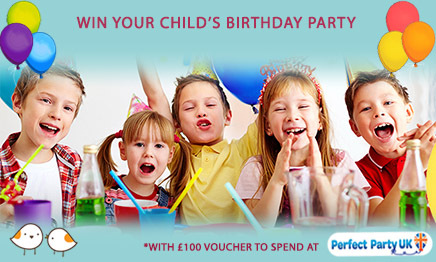 Fancy winning your child’s birthday party with £100 voucher to spend at Perfect Party UK?